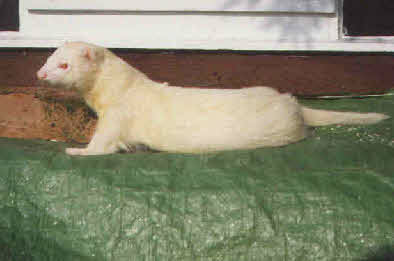 Psychos was an albino hob I found when fishing at local lakes. I put him in a canvas shopping bag to transport home, but he escaped when he made a tiny hole ferret sized. A fellow angler watched my fishing tackle so I could walk home, holding the ferret in full public view . Dad named him, due to his bizarre habits, such as on occasion drinking his own urine and being a bit daft.